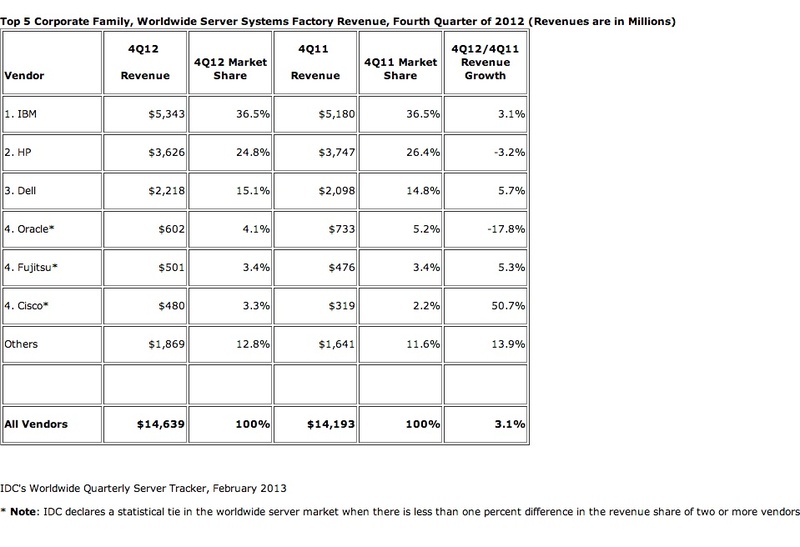 Whatever happened to Oracle’s server business? Here’s the problem, since it entered the hardware business, Oracle hasn’t sold enough engineered systems to make up for lost sales of lower-end machines, according to third-party researchers. Its hardware revenue and unit share is headed south. For the fourth calendar quarter of 2012, Oracle server revenue was down 18 percent year over year according to both Gartner(s it) and IDC. Meanwhile, as GigaOM’s Jordan Novet reported last week, the “other” server vendors — companies like Quanta and Wistron — saw their aggregate revenue rise nearly 22 percent in the fourth quarter compared to the year-ago period. In units, the “other” category saw 35 percent growth. These are the types of servers that sell into huge web-scale data centers run by Facebook(s fb) and Amazon(s amzn). This is not a new thing: In the third quarter of 2012, Gartner numbers showed Oracle’s server revenue off 22.5 percent while “other” servers revenue was up 27 percent. Oracle’s own figures reinforce this narrative. In its third quarter, ending in November 30, 2012, Oracle hardware systems revenue fell 23 percent to $734 million from $953 million for the year-ago period. The IDC findings are below. Obviously, Oracle sees huge potential in these high-end boxes — Nomura Securities’ analyst Rick Sherlund said “the Exaseries of servers are growing about 100 percent, but that has not been enough to offset the loss of the other business yet.” The question is how patient Oracle is prepared to be. I’ve reached out for comment and will update this if one is forthcoming. Update: An Oracle spokeswoman declined to comment, citing the company’s quiet period before its next earnings report. Here’s the thing, while Oracle regroups and repositions its server business, the trajectory for “other” servers is way up and Oracle keeps heading in the other direction. It’ll be interesting to see if there’s any indication of a change on Oracle’s third quarter earnings call March 20. This story was updated at 9:40 a.m. PDT with a statement from Oracle. Q3FY12: Both GAAP and non-GAAP hardware systems products revenues were down 16% to $869 million. Figures don’t lie but liars do Figure. IDC and Gartner are not getting the full picture as I am sure non of the vendors are sharing their true revenue and unit #’s so its all a guessing game by IDC and Gartner. Look at IBM’s last 4 Qtrs of Financial statements and question how is it that IBM’s Power systems business is down so much? Typical Oracle attitude. Phil, clearly an Oracle employee, wants us to believe that Oracle quarterly revenue = Sun hardware revenue. The reality is that Oracle’s hardware business is down the toilet and they should now be considered a niche vendor. Sorry Phil, but the real numbers don’t lie in spite of your valiant efforts to “prove” the contrary. Sun’s acquisitions is value add to oracle and i am sure customers will make benefit out of it. Oracle has one of the world’s powerful hardware! Remember business is not about what you make, but what you keep. Although revenues are less on the hardware business, margins on the engineered systems are very good. I personally have not done the math to see which way the profits from that line of business is trending. Don’t assume just because the revenue is down, that the profits are as well. that’s what they keep saying. But i also hear the discounting is huge — they have to cut prices to move these machines. I think the real end game is support/service long term and many ORCL customers know that and don’t like the idea of that expensive lock in. Your perception of Oracle lock-in is completely false and misleading as there are very few Oracle products that have any lock-in at all, especially compared to its main competitor IBM, where they truly have many lock-in technologies especially related to tie-ins to its servicing arm. Oracles engineered systems can be easily migrated on to and off from without Oracles involvement and practically every Oracle technology is based on open standards and can run across many other vendors products. As for discounting, have you seen IBM discounting up to 90% on its Power systems and HP giving away its Itanium servers to stay alive and relevant. Until you have some substantiations on your claims, they dont hold any water. Oracle’s purchase of Sun was a mistake. I really don’t see that they got much, if anything, of value out of it. The hardware business has been falling off a cliff ever since they made the acquisition. Those -20% drops every quarter start to add up quickly. In terms of software, the best assets like Java and MySQL are open source. So, Oracle is not going to make any money off of these. Worse is that Oracle has been handling these assets so poorly that people have already forked out a competitor to MySQL called MariaDB. It has been gaining more and more steam and may ultimately replace MySQL as the most popular open source database. You also have to wonder how many resources has Oracle wasted on trying to salvage the failed Sun acquisition. They have been hyping the Sun hardware at their yearly conferences to the detriment of their real business, software. I know a lot of people are getting sick of hearing about Exa-blahblahblah at these conference, when what they came for was to hear about the latest software advancements. Oracle really needs to just flat out admit that they made a mistake and move on. They have wasted far too much time and money on Sun already! I think Oracle really thought it could wring software-like margins out of hardware. Just don’t see that happening esp. in this new era, as you note. Plus software margins are in jeopardy as well. A pithy comment “no matter how many facelifts you get, everyone dies at some point”. A more specific point, is that Oracle senior mgmt has been overhyping “Engineered Systems” as some highly demanded product by the market. It is a hiche product at best, and one that many companies are moving further and further away from – which is bloated, overpriced Oracle software, slapped into overpriced hardware. The trend is more towars low-cost x86 systems (even as extreme as the Open Compute Project started by Facebook) with more modern internet based applications. These applications can use noSQL and newSQL databases, and modern development tools. There is still life in Java, and still plenty of life left in the Oracle DB for more traditional computing, but on the more modern compute waves happening, Oracle has a whole bunch of old overpriced stuff. How many people want to buy Oracle Apps, or Peoplesoft, or Siebel or JD Edwards, compared with newer SaaS based alternatives. Sorry to say, but Oracle’s days of being a market leader are slipping away from it. Engineered systems will not save it, and the SPARC engineering and support will continue to weight down on this beast of a company. They have had a great ride. i agree that oracle’s strength still lies in its powerhouse database. Many companies in financial and some other sectors feel they really can’t leave oracle as much as they would like to given support and service costs. Not sure if Oracle can successfully parlay that into making exa-servers a for-real business however. Poor timing is uncharacteristic of Mr. Ellison. Guess he was due.